Whether you’re a start-up business or an experienced owner, The Graphic Designer’s Guide to Pricing, Estimating and Budgeting, Revised Edition, provides a one-stop source of indispensable, innovative methods for achieving productivity and profitability in every area of a graphic design business. This brand-new and completely updated edition offers practical guidelines for setting rates, dealing with clients’ budgets, preparing an estimate, and establishing profitability. Readers will also discover step-by-step strategies for pricing on the Internet, negotiating effective pricing with clients, and developing options to traditional pricing. Plus, the easy-to-read sidebars throughout this valuable guide offer dozens of creative, resourceful success tips for running a top-notch business. Theo Stephan Williams is the founder of Real Art Design Group, Inc., an award-winning, full-service graphic design firm whose international client base includes Universal Studios Hollywood, the Walt Disney Company, and Mead Corporation. The author of The Streetwise Guide to Freelance Graphic Design and Illustration, she lives in Los Alamos, California. Now a day’s there are many graphics design service provider. But, there pricing, estimating is not compatible. 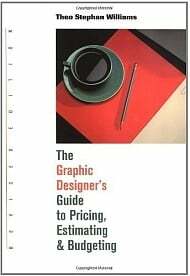 But, It’s an amazing graphic designer’s guide to pricing, estimating & budgeting.